It's been a rough couple of years for the oil industry. For nearly two decades it suffered with historically low prices that limited its ability to explore for new reserves, and then was blasted by virtually everyone when oil prices skyrocketed. To add insult to injury, despite a relatively good safety and environmental record when it came to off-shore drilling, the Deepwater Horizon explosion, loss of human life and resulting oil spill demonized those efforts and resulted in a renewed moratorium by the Obama administration. Very quickly BP became the hated face of the oil industry, both by the public and its peers. Loren C. Steffey, business columnist with the Houston Chronicle, explores the record of BP in Drowning in Oil: BP & the Reckless Pursuit of Profit. Though the title suggests an anti-oil industry manifesto with BP serving as its face, it's actually an even-handed account of the company's efforts – led by former chief executive John Browne – to become the world's biggest oil company. Those efforts unfortunately included cuts in health and safety programs, engineering expertise and a laid-back attitude towards potential environmental catastrophes. Perhaps most unfortunately is the fact that many people have paid with their lives at BP operations, including 11 people on the Deepwater Horizon. Drowning in Oil opens its account with the horrible events of April 20, 2010 when drilling at BP's Macondo Prospect caused a blowout and resulting explosion that killed several crew members. Reconstructing the story from publicly available testimony and industry experts, Steffy relates the horrifying story of the explosion and the survivors' attempts to survive and escape the burning drilling rig. Desperate attempts by BP, Transocean – owners of the Deepwater Horizon, and other company's employees to shut down the rig all failed and it sank two days later, causing an oil spill that wasn't officially stopped until September 19. From there Steffy relates the company's recent history, one that is appalling in its dereliction towards safety and industry standards. In Browne's attempts to grow BP, it moved aggressively into North America with mergers with Amoco in 1998 and Arco two years later. The company cut to the bone in order to improve its bottom line, resulting in accidents in Alaska which spilled oil or the catastrophic accident at Texas City in 2005 which claimed the lives of 15 workers. Maintenance was repeatedly deferred at Prudhoe Bay and Texas City, resulting in accidents which earned the BP the reputation by those both in and out of the industry for playing fast-and-loose with standards, not to mention that it was a lethal company to work for. Fines and growing public distrust of the company seemed to do little to change a corporate culture that rewarded improving the bottom line over almost any other consideration. Although Steffy rarely overtly attacks BP and Browne, he doesn't need to as their own actions are editorial enough already, one can almost feel the anger coursing through his account. Like a boxer against an overwhelmed opponent, he continually pounds the company by chronicling its refusal to spend money on real safety initiatives and the accompanying loss of life, the liberties taken with the environment and a corporate culture that all but promoted a sense that no one was ever really responsible for the company's actions…particularly if BP continued to earn record profits. To this today, he shows, the company still believes the Deepwater Horizon event was an isolated incident and not part of a continuing series of events with a common underlying cause. As engaging as Drowning in Oil is, anyone expecting a thorough exploration of the Deepwater Horizon event is likely to be disappointed given the investigation into it is still ongoing. Nor is the ground that Steffy covers particularly new given that Tom Bower's Oil: Money, Politics, and Power in the 21st Century also spent much of its time covering BP's checkered history when it comes to safety and maintenance issues, and Browne's desire to turn the company from a perceived also-ran into the world's preeminent oil company, a campaign that contributed greatly to BP's lax standards. That said, though Steffy's effort adds little new, it is a marvellous introduction to those who only know BP because of the Gulf of Mexico accident. The conclusion to the Deepwater Horizon story has of course yet to be written. Only last week was a massive lawsuit filed by the U.S. government against BP, and other companies connected to the event, to recover costs related to the clean-up of the spill. 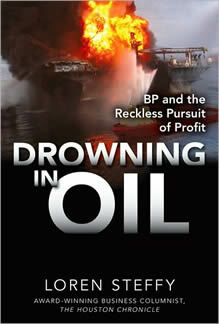 Drowning in Oil is a worthwhile read if only to know why such a thing could happen – how years of ruthless cost-cutting set the stage for repeated accidents. Thanks to Steffy, and others, we know that BP's public image was mostly a façade, that it presented itself as a company that cared but was really an extension of Browne's ego until his unceremonious departure in May 2007. Deepwater Horizon may have happened only eight months ago but its story began much earlier than that. Steven Martinovich is the founder and editor-in-chief of Enter Stage Right.